I have always been a huge fan of Faces Cosmetics. I have used a LOT of products from this brand and I must say they never fail to impress me. I would not say Faces Cosmetics Stackables are new launches but they are always in as the shades in them are all trendy and evergreen. 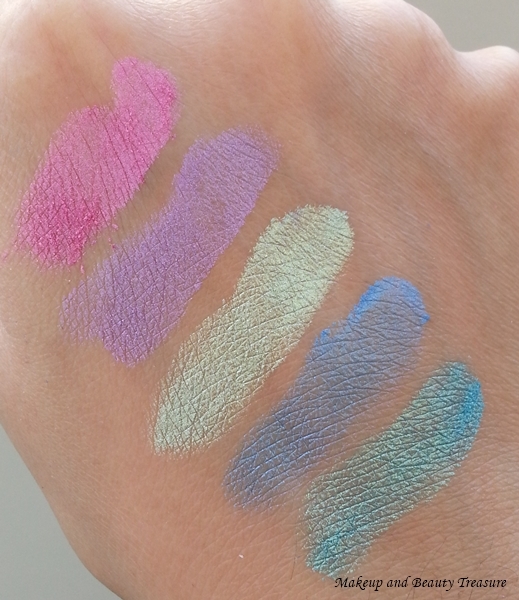 I got the shade “Wild” that consists of all pigmented yet wearable shades. The stackables are priced at 799 INR and you can BUY ONLINE HERE. Faces Cosmetics Stackables* comes sealed with the ingredients list stuck over it. The eyeshadows are filled in the clear plastic tub and are screwed one over the other. The top eyeshadow has a screw top lid with Faces Cosmetics logo over it. The packaging is very handy and the stackable can be easily carried in a bag whilst traveling. The stackables come in 4 shades- Wild, Glitter, Whish and Zebra! The texture of the eyeshadow is powdery with silky feel. Though they are shimmery eyeshadows but they do not look over the top. To prevent fall outs, firstly I apply an eyeshadow primer, take a small eyeshadow brush, swipe the brush lightly over the powder, tap it on the side of the tub and pat it gently over my eyelids. This way I do not face fall outs! the pigmentation is pretty superb. I get true color payoff in just a single application. I have slightly oily lids and the color stays for about 6-7 hours with an eye primer on. • Hot Pink: it is a shimmery hot pink color that looks pretty chic on its own. • Lilac: It is light lilac color that complements well with hot pink. I sported this duo shade on Valentine’s day but alas forgot to click the picture. • Light Green: It is a light pistachio green color. It looks elegant on eyes when paired with dark green eyeshadow! • Electric Blue: This shade is the hottest among all and is perfect for smoke-y eye looks! • Persian Green: It is truly a unique and the most beautiful shade in the stackable. I loved combining this shade with black or gold! • Full list of ingredients mentioned. • Shadows will work on any skin tone. • The texture is soft and velvety smooth. • All the shades are wearable. • No fallout with eye primer on! • Eyeshadows last for the longest time and fades a bit at the end of the day. • Inexpensive for the 5 eyeshadows! • Can be easily removed with a makeup remover. • No mirror or sponge! I am very impressed with Faces Cosmetics Stackables. They are worth the value and look stunning on eyes. You get 5 shades in one stackable! I would highly recommend it to everyone! • If you have very oily lids, apply oil control eye primer prior to eyeshadow application. • You can use the “wet” brush for more intensity! • Apply eyeshadow primer to prevent fallouts! • You can use either fingers or brush to apply these eyeshadows. I prefer using clean finger when I am in hurry! • The shades can be mixed with a clear nail polish to get the glittery gorgeous nail polish color! Have you tried Faces Cosmetics Stackables?